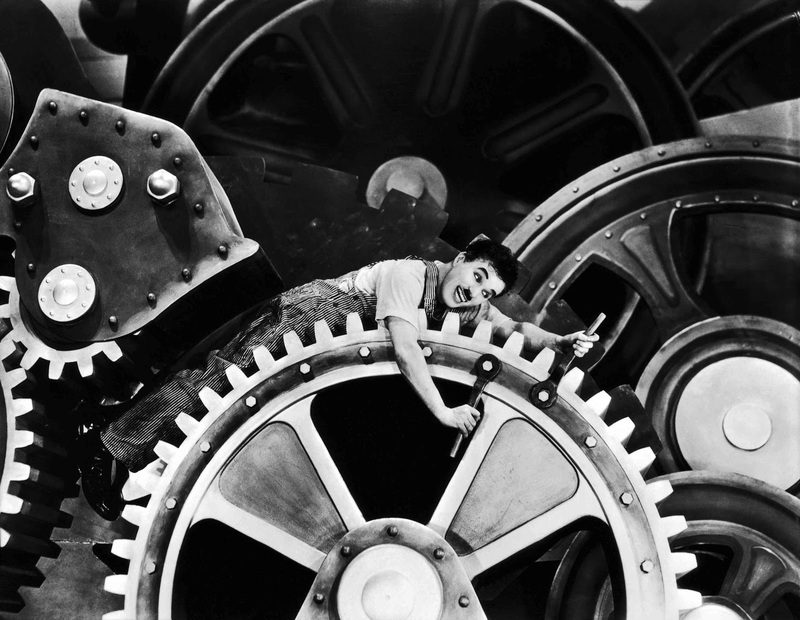 Lost in the Movies (formerly The Dancing Image): Want to read an essay about Chaplin? Want to read an essay about Chaplin? Aloud? In my video essay? Right now?? I am preparing my entry in the Wonders in the Dark comedy countdown, which will appear by early tomorrow morning on that site and mine. It's a video essay in which I interweave clips from Modern Times with selections from great pieces by Roland Barthes, Graham Greene, and Otis Ferguson. Right now, the temp track I'm cutting to is my voice narrating all three authors and frankly I'd rather have a variety of narrators especially to cut back and forth between the authors, putting them into conversation without confusion as to whose saying what (at present, I'm using titles to indicate this but shifting voices would of course be easier). 1) The essays are listed below. Select one and leave a comment indicating which you've taken (so that if someone else volunteers, they don't take the same one). 2) Read it into your iPhone or other recording device if you have one, and then send me the voice file. If you keep it under 5-7 minutes, or record it in segments less than 5-7 minutes, you should be able to send it in one email. On the iPhone in particular this is very easy to do. My email is movieman0283@gmail.com . 3) Sit back and let me take care of the rest. Unfortunately I'll be away from email for a few hours (so don't ask me, just go for it! ), but when I return I'll take what I've gotten and replace my own temp track with your voice. Presto! A Greek chorus of bloggers impersonating critics of old. Fair warning, though, if someone has already sent me a recording of one of these I can't guarantee I will use yours. It only takes five minutes, but only take the leap if you're okay with that possibility. Otis Ferguson, "Hallelujah, Bum Again"
Modern Times is about the last thing they should have called the Chaplin picture, which has had one of the most amazing build-ups of interest and advance speculation on record. Its times were modern when the movies were younger and screen motion was a little faster and more jerky than life, and sequence came in 40-foot spurts, cut off by titles (two direct quotes here are "Alone and Hungry" and "Dawn); when no one, least of all an officer of the law, could pass a day without getting a foot in the slack of his pants, when people walked into doorjambs on every dignified exit, stubbed toes everywhere on the straightway, and took most of their edibles full in the face; when tables and chairs were breakaways, comedy was whiskers, and heroes maneuvered serenly for minutes on abysses that were only too visible to the audience. It is in short a silent film, with pantomime, printed dialogue, and such sound effects as were formerly supplied by the pit band and would not be done by dubbing, except for Chaplin's song at the end. And not only that: it is a feature picture made up of several one- or two-reel shorts, proposed titles being The Shop, The Jailbird, The Watchman, The Singing Waiter. Part of this old-time atmosphere can be credited to the sets. The factory layout is elaborate and stylized, but not in the modern way or with the modern vividness of light and shadow; the department store might have been Wanamaker's in its heyday; the "dance" music is a cross between Vienna and a small-town brass band, twenty years old at least; the costumes are generally previous; and as to faces and types, Chaplin has kept a lot of old friends with him, types from days when a heavy was a heavy and Chester Conklin's moustache obscured his chin (still does). Above everything , of course, is the fact that the methods of silent days built up their tradition in group management and acting - in the first, a more formal explicitness, so that crowds gather jerkily from nowhere, emphasized players move stiffly front and center, the camera does less shifting; in the second, actors tend to undelrine their parts heavily and with copious motion (see the irate diner, see the hoity-toity wife of the parson, see Big Bill and the rest). Modern Times has several new angles, principally those of the factory and the occasional off-stage reports of strikes and misery (the girl's father was shot in a demonstration). But they are incidental. Even in taking Rene Clair's conveyor-belt idea, for example, you can almost hear Chaplin, where Clair directed a complex hubbub, saying to one of his old trusties: You drop the wrench, I kick you in the pants, you take it big, and we cut to chase, got it? It has the thread of a story: Chaplin's meeting up with the orphan girl, very wild and sweet, and their career together. For the rest it is disconnected comedy stuff: the embarrassing situation, the embroilment and chase, and the specialty number, e.g., the roller skates, the completely wonderful song-and-dance bit, the Chaplin idyll of a cottage and an automatic cow, beautiful with humor and sentiment. These things and the minor business all along the way - in jails, cafeterias, with oil cans, trays, swinging doors, refractory machinery - are duplicates, they take you back. But such matters would not call for discussion if all together they did not set up a definite mood, a disturbing sense of the quaint. Chaplin himself is not dated, never will be; he is a reservoir of humor, master of an infinite array of dodges, agile in both mind and body; he is not only a character but a complex character, with the perfect ability to make evident all the shades of his odd and charming feelings; not only a touching character, but a first-class buffoon and I guess the master of our time in dumb show. But this does not make him a first-class picture maker. He may personally surmount his period, but as director-producer he can't carry his whole show with him, and I'll take bets that if he keeps on refusing to learn any more than he learned when the movies themselves were just learning, each successive picture he makes will seem, on release, to fall short of what went before. The general reaction to this one anyway is the wonder that these primitive formulas can be so genuinely comic and endearing. There has been a furor here and there in the press about the social content of Modern Times, and this could be skipped easily if Chaplin himself were not somehow confused (see his introduction to the film) over its worth as corrective comment. Well, the truth is that Chaplin is a comedian; he may start off with an idea, but almost directly he is back to type again, the happy hobo and blithe unregenerate, a little sad, a little droll. Whatever happens to him happens by virtue of his own naive bewilderment, prankishness, absurd ineptitude, and the constant support of very surprising coincidence. He couldn't keep a job or out of jail anywhere in the world, including the Soviet Union - that is , if he is to be true to the Chaplin character. And Chaplin is still the same jaunty wistful figure, pinning his tatters about a queer dignity of person, perpetually embarked on an elaborate fraud, transparent to the world but never very much so to himself. He brings the rites and dignities of Park Avenue to the gutters of Avenue A, and he keeps it up unsmilingly until it is time to heave the pie, to kick the props out, to mock with gestures and scuttle off, more motion than headway, all shoes, hat, stick, and chase. With him it is all a continuous performance, played with the gravity, innocence, and wonder of childhoood, but with ancient wisdom in the matters of snipping cigar butts and tripping coppers into the garbage pile. He is pathetic with the unhappiness of never, never succeeding - either in crossing a hotel lobby without at least one header into the spittoon or in eating the steaks, chops, and ham and eggs that are forever in his dreams; and yet he somehow cancels this or plays it down: when the ludicrous and debasing occurs, he picks himself up with serenity and self-respect, and when it is time for heartbreaks he has only a wry face, a shrug, some indication of that fall-to-rise-again philosophy htat has made hoboing and destitution such harmless fun for his own special audience, the people of America. His life on the screen is material for tragedy, ordinarily. But on the screen he is only partly a citizen of this world: he lives mostly in that unreal happy land - you see the little figure walking off down the road toward it always into the fade-out - where kicks, thumps, injustice, and nowhere to sleep are no more than a teasing and a jolly dream (Oh, with a little pang perhaps, a gentle Woollcott tear) and the stuff a paying public's cherished happy endings are made of. I am too much an admirer of Mr. Chaplin to believe that the most important thing about his new film is that for a few minutes we are allowed to hear his agreeable and rather husky voice in a song. The little man has at last definitely entered the contemporary scene; there has always before been a hint of 'period' about his courage and misfortunes; he carried about with him more than the mere custard-pie of Karno's days, its manners, its curious clothes, its sense of pathos and its dated poverty. There were occasions, in his encounters with blind flower-girls or his adventures in mean streets or in the odd little pitch-pine mission halls where he carried round the bag or preached in pantomime on a subject so near to his own experience as the tale of David and Goliath, when he seemed to go back almost as far as Dickens. The change is evident in his choice of heroine: fair and featureless with the smudged effect of an amateur water-colour which has run, they never appeared again in leading parts, for they were quite characterless. But Miss Paulette Goddard, dark, grimy, with her amusing urban an dplebeian face, is a promise that th elittle man will no longer linger at the edge of mawkish situation, the unfair pathos of the blind girl and the orphan child. One feels about her as Hyacinth felt about Millicent in The Princess Casamassima: 'she laughed with her laugh of the poeple, and if you hit her hard enough would cry with their tears'. For the first time the little man does not go off alone, flaunting his cane and battered bowler along the endless road out of the screen. He goes in company looking for what may turn up. What had turned up was first a job in a huge factory twisting screws tighether as little pieces of nameless machinery passed him on a moving belt, under the televised eye of the manager, an eye that followed him even into the lavatory where he snatched an illicit smoke. The experiment of an automatic feeding machine, which will enable a man to be fed while he works, drives him crazy (the running amok of this machine, with its hygieneic mouth-wiper, at the moment when it has reached the Indian corn course, is horrifyingly funny; it is the best scene, I think, that Mr. Chaplin has ever invented). When he leaves hospital he is arrested as a Communist leader (he has picked up a red street flag which has fallen off a lorry) and released again after foiling a prison hold-up. Unemployment and prison punctuate his life, starvation and lucky breaks, and somewhere in its course he attaches to himself the other piece of human refuse. The Marxists, I suppose, will claim this as their film, but it is a good deal less and a good deal more than Socialist in intention. No real political passion has gone to it: the police batter the man at one moment and feed him with buns the next: and there is no warm maternal optimism, in the Mitchison manner, about the character of the workers: when the police are brutes, the men are cowards; the little man is always left in the lurch. Nor do we find him wondering 'what a Socialist man should do', but dreaming of a steady job and the most bourgeois home. Mr. Chaplin, whatever his political convictions may be, is an artists and not a propagandist. He doesn't try to explain, but presents with vivid fantasy what seem to him a crazy comic tragic world without a plan, but his sketch of the inhuman factory does not lead us to suppose that his little man would be more at home at Dneipostroi. He presents, he doesn't offer political solutions. This post will be deleted in eight hours. I'll try for the Otis Ferguson one. Excellent!! Looking forward to it. Also, sorry if it's too late but if you can make the file m4a (or anything Final Cut/Apple can read with ease) that would be great! Thanks! The recording program I have only makes MP3 and WAV files. I just sent you an MP3. Does that work? Neon Genesis Evangelion, Episode 6 - "Rei II"